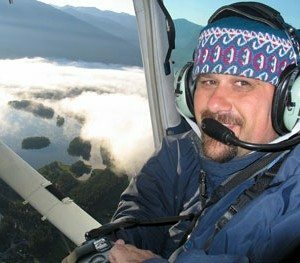 George grew up playing with cameras through his father who was a motion picture editor with an interest in photography.George founded Pilot Getaways magazine with his brother in 1998, and quickly learned the skills of air-to-air photography. He has photographed most of Pilot Getaways’ aerial photographs, including all but four covers. George has traveled to 47 of the United States and 30 foreign countries, much of it in small aircraft. He started his pilot training in 1995, and flies many hours every year with his brother in their Cessna 185,researching and photographing new destinations for their magazine. One of his specialties that has become popular among the magazine’s subscribers is the “approach shot” taken from behind,where the airplane is shown landing at a new destination. In addition to his own magazine, his work has been published in Air & Space Smithsonian, Flying, Plane & Pilot, AOPA Pilot, and Outside magazines, in addition to various calendars,catalogs, advertising campaigns, and even t-shirts. He became an ISAP board member in 2011.